Donald Trump is a conservative media creation: Right-wing media has engaged in race baiting for years. The real estate mogul’s racist and xenophobic message is a product of years of race-baiting from right-wing media. Republican presidential candidate Donald Trump speaks during a town hall meeting during a campaign stop at Des Moines Area Community College Newton Campus on Nov. 19, 2015 in Newton, Iowa. Donald Trump has spent most of his campaign indulging and encouraging nativism and anti-immigrant sentiment. When it came to other racial and ethnic groups, however, Trump was silent, even telling crowds that he had a “great relationship with the blacks.” This past weekend, that changed. On Saturday, Trump spoke to thousands at a rally in Birmingham, Alabama. At some point, a local black activist—shouting “Black Lives Matter!—interrupted the event. This prompted a fight, and soon, the activist was on the ground as several men kicked and punched him. The crowd booed, cheered, and chanted, “All lives matter.” Trump wanted him removed. “Get him the hell out of here, will you, please?”, he said. “Get him out of here. 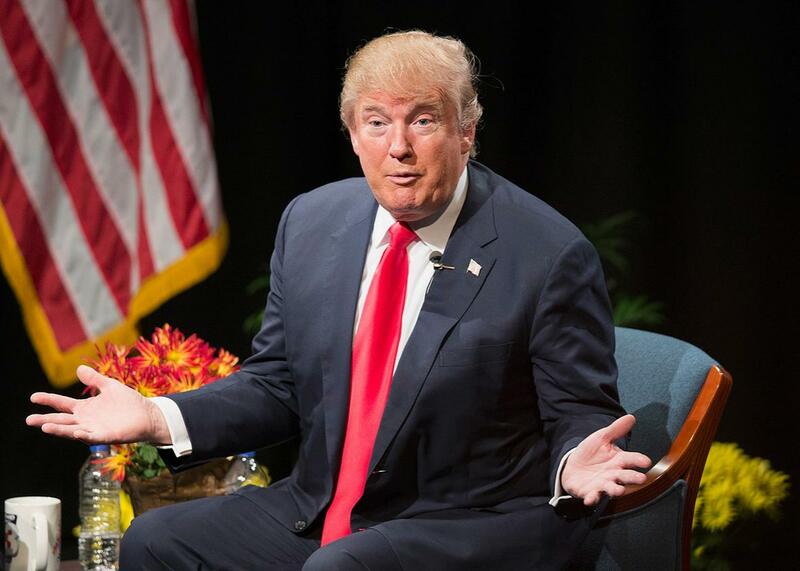 Throw him out!” The next day, on Fox News, Trump was unsympathetic to the protester. “Maybe he should have been roughed up because it was absolutely disgusting what he was doing,” he said. The same Sunday, in an interview on ABC’s This Week, Trump told George Stephanopolous that “thousands and thousands of people”—Arab Americans—were “cheering” as the World Trade Center fell on Sept. 11, 2001. This is false—there’s no evidence it happened. Trump, however, doesn’t seem to care. And later that evening, on Twitter, he “retweeted” an image of alleged racial crime statistics from the nonexistent “Crime Statistics Bureau” in San Francisco. The chart—which also depicts a (presumably black) gang member holding a gun—claims that 81 percent of white Americans are killed by blacks, and that 97 percent of black Americans are also killed by blacks. This is also racist, and it’s also false: According to the latest homicide data from the FBI, 82 percent of whites in 2014 were killed by whites, and 90 percent of blacks were killed by blacks. Just under 15 percent of whites were killed by blacks. All of this reflects the fear and bigotry that animates much of Trump’s campaign. And in fact, the false crime meme literally comes from online “white nationalists.” But while Trump has been explicit with his nativist, and now racist, rhetoric, he’s not an innovator. If large numbers of Republicans are responsive to Trump’s vitriol, it’s because he echoes—in less coded terms—the discourse of much of right-wing media. In conservative entertainment, race panic sells. And if you’ve watched Fox News at all in the past seven years, followed websites like Breitbart, or listened to conservative talk radio, you’ve experienced it. Likewise, at popular right-wing websites like Breitbart and Human Events, writers warned their readers of the “knockout game,” where black teens would attack unsuspecting whites with a knockout punch to the head. “Coming soon to a city near you: The knockout game,” reads one headline among many. On any given day, conservative personalities like Bill O’Reilly and Sean Hannity are denouncing “thugs” and “thug culture,” while mainstream conservative writers are warning of crime waves sparked by black political activism. This material just scratches the surface of the race panic that’s ubiquitious throughout conservative media, from breathless coverage of Black Lives Matter on Fox News (a “hate group” that’s “like the Ku Klux Klan”) and fearmongering on immigrant crime from conservative radio hosts, to race-baiting on conservative websites. And it reaches millions of Americans, many of them Republicans, who listen and watch it as part of their daily lives. Of course Trump would sound off on immigrant crime and disloyal Muslims and criminal blacks. He is fundamentally an entertainer, and in conservative entertainment, those are the money shots: The stories that capture attention and drive ratings. And on the same score, his supporters—the tens of thousands of people who show up for his rallies—are thrilled to hear them.